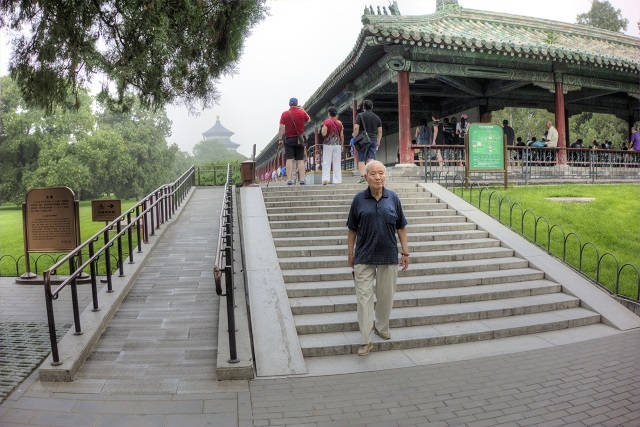 If you visit the Temple of Heaven in the heart of Beijing, you’ll discover a vast network of palaces, pavilions, altars, stages and walking paths scattered over 600 acres of parkland. Recognized as a World Heritage Site for its exceptional architecture and landscape design, the Temple of Heaven served for centuries as a private place of worship for Chinese emperors. Not unlike many of Europe’s royal palaces and gardens, it wasn’t until the early 20th century that these grounds were opened to the general public. 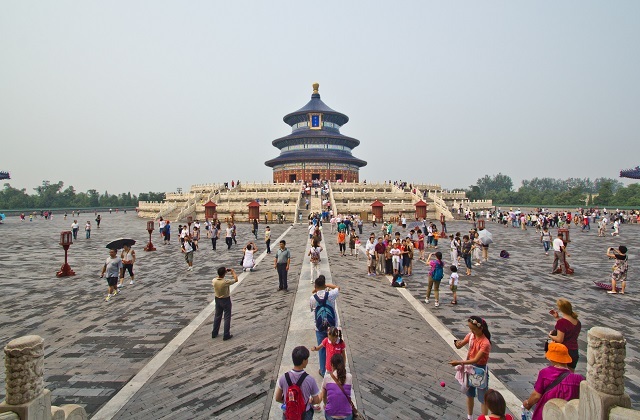 Understandably a magnet for tourists, a little-known fact is that the Temple of Heaven has also helped to redefine the notion of public space in Beijing. Here, you will discover a hybrid experience that combines centuries-old buildings and exceptional architecture not just with a thriving, modern public park, but also an outdoor workout facility so compelling that hundreds of locals convene here every day for exercise and just to meet and convene. Two-thirds the size of New York’s Central Park, the sprawling grounds of the Temple of Heaven appear like a giant mushroom from the air, with two major altars dominating the north and south entrances to the park. However, the easiest way to access the exercise area is from the eastern entrance. When you do enter the grounds for the first time, the sudden transition from serene green space to bustling outdoor playground catches you off guard. With little advance warning, you’re suddenly confronted with a sea of residents participating in group activities, playing badminton, traversing meditation trails and working out on calisthenics equipment. But it isn’t chaos. Scanning the grounds from left to right, you’ll notice first the grassy area used by groups practicing tai chi or dance. To the right, a large asphalt surface commonly used for badminton, meditation or just chatting with friends. Behind this is the calisthenics area with dozens of pieces of equipment ranging from incline benches to every imaginable exercise bar. It’s essentially a playground for residents of all ages. And unlike high-end gyms, there’s no costly membership fee and the atmosphere is collegial, all of which help to explain why so many people of all ages and social and economic backgrounds are drawn here – and keep coming back. 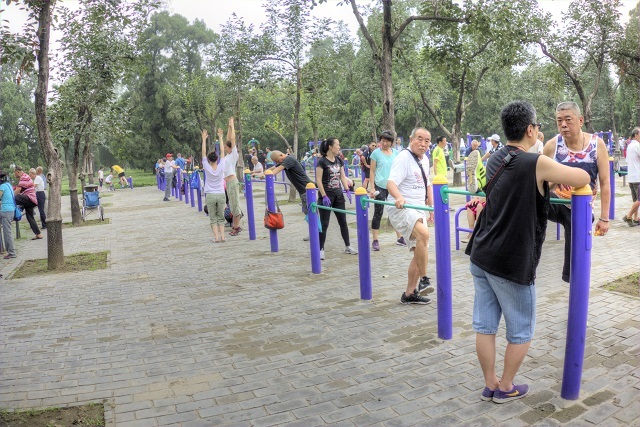 On weekdays, those using the exercise area are predominantly middle-aged and older locals. Many are retired or semi-retired and workout as part of their daily routine. But on weekends, a broader cross-section of society are also drawn to the idyllic setting. It’s not unusual for multiple generations to workout alongside one another. 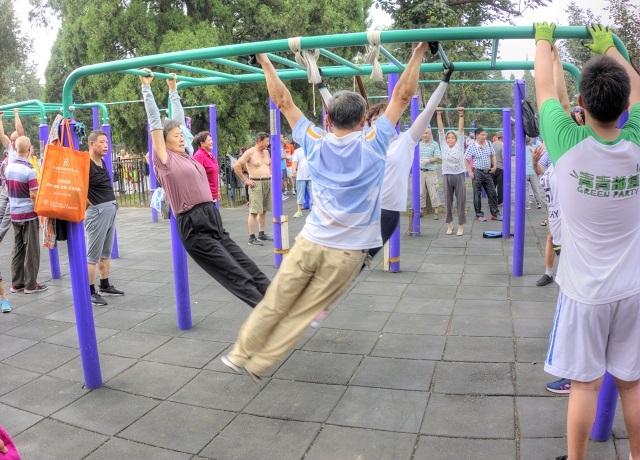 Outdoor gyms have been a common fixture in China for decades. 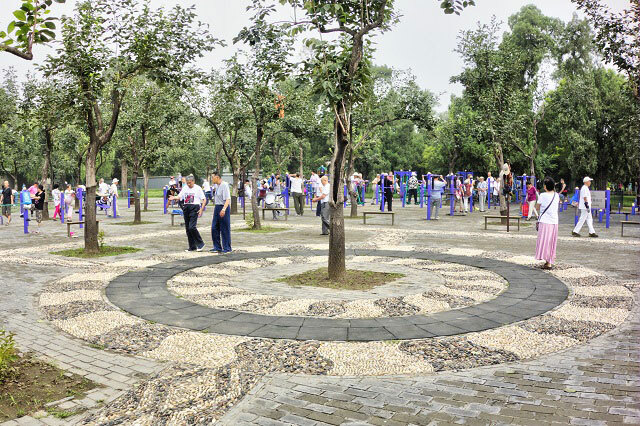 Leading up to and in the wake of the 2008 Beijing Olympics, however, more thought and effort has gone into the functionality of hybrid public spaces like the Temple of Heaven, including adding more modern calisthenics equipment. One may think that this use of public space for exercise and wellbeing conflicts with historic preservation. But the mixed offering provides added incentive to visit these attractions and encourages not only exercise but interaction. It also brings locals to visit more cultural and historic sites, activities that may otherwise seem exclusively for tourists. It combines enthusiasm for history and cultural heritage with the traditional Chinese focus on fitness and mental wellbeing. All of this aligns with the forward-thinking idea of creating more hybrid experiential places in cities, places where people can go to do a variety of activities in a social setting, whether exercising, relaxing, convening, touring or enjoying some cultural events. And this isn’t exclusive to China. In select neighborhoods in Frankfurt, Germany, former parking lots have now become community gardens, some of which are also used for public art displays and outdoor book exchanges. Another example of hybrid urbanism is the Parc Rives de Seine in Paris, a former road running along the River Seine that has been transformed into a playground, workout area, outdoor café, and place to bike, run or stroll. A smaller example can be found along Toronto’s bustling King Street, where, as part of a pilot project still underway, dozens of parking spaces along a 1.25 mile stretch have been converted into a linear park comprised of public seating areas, restaurant patios, game stations and art exhibits. Whether in Beijing, Frankfurt, Paris or Toronto, these hybrid spaces break down social and economic barriers and encourage social interaction. The best use of public space ultimately comes down to what resonates the most with locals, with perspectives varying considerably from one city to the next. In the case of Beijing, this compelling hybrid mashup of history, architecture, parkland and workout area may still be the secret of locals, but perhaps not for long. Mark Wessel is a writer and public speaker who profiles unique city initiatives tied to sustainability, resiliency and quality of living that other communities can learn from. His work has appeared in Next City, Municipal World, Cities Today, Urban Future and selected Postmedia newspapers.